Whiz all ingredients in a mini food processor till smooth. This dip is soooo good. Even people who hate cottage cheese will love it. I'm dipping cucumber slices (my crackers) in it tonight but it's also great for dipping meats (moisture is key to eating meat post weight loss surgery) or can be used as a high protein salad dressing replacement. Thank you for the wonderful response to the Green Giant Giveaway. Hope you make & enjoy the Speedy Broccoli Cheese Soup. Congratulations!!! You are the winner of the Prize Pack (insulated bag, pedometer, bowl & spoon, and free veggie coupon.) Check your mail and follow email instructions for claiming your prize. Another super groovy giveaway is in the works! Umpqua Not Guilty Oatmeal No added sugar or salt. Naturally sweetened with apples, blueberries, flax and chia seeds. I added 1 packet of Splenda. Very yummy. 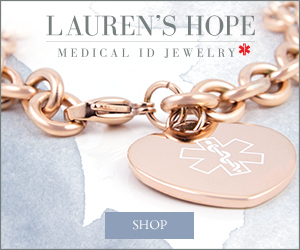 Click here to locate a store near you that carries it. It would be absolutely perfect for post weight loss surgery traveling. Comes in a paper container, you fill it with hot water, put the lid back on and let it steep for 2-3 minutes. So on a plane... perfect. Toss it in your carry-on and ask for hot water when the beverage cart comes round. Sure beats the $7 snack boxes full of poor choices. Lunch: Made a protein shake. I have a chest freezer I seriously need to defrost very soon, so I'm trying to reduce stock a bit. It's basically filled with frozen fruit. When cherries and strawberries are super cheap I always grab a bunch and freeze them for my protein shakes and smoothies. Whiz in blender till smooth. Top with a squirt Sugar Free Land o Lakes Whipped Cream, optional. Dinner: Made one of my favorites Philly Cheese Steak Casserole. Nom. Snacks: Oodles of coffee, a bag of Crunchy Cheese and I'm back on a Fluff Stuff kick. Love this stuff. You remember Jello 123 from the 80's... it's basically like that but better. I made a Lime and Mango version and ate a dollop of it during Top Chef. Pour boiling water slowly over jello mix. Stir till dissolved. Set aside. Mix yogurt & syrup together till well combined. Add to Jello mixture. Beat with an electric mixer till well combined. I use this gadget. A pretty darn tasty day. A few months ago I was asked to participate in the MyBlogSpark™ program. Basically it's a group of bloggers that have access to review products and services and participate in giveaways. I have not had too many come across my inbox that I felt matched my goals as a blogger (a lot of pasta, rice and potatoes have been offered) but this one I thought yeah I'll do that... I love veggies! Green Giant provided me with a sample of their boxed vegetables and some fun goodies. I ate them and now I'm sharing my thoughts with you. I am lucky to live in Southern California where Farmer's Markets are year-round so we are never really at a loss for the freshest veggies, veggies that taste like what they are supposed to taste like. I remember growing up on Long Island and in the cold of winter, under a blanket of snow, the only veggies in the supermarket produce section were shipped in from who knows where, by the time they reached our dinner table the flavor was long gone and I'm sure nutrients too. Green Giant boxed frozen veggies solves that issue. They are picked at the peak of freshness and frozen so when you taste the broccoli it tastes like what broccoli should taste like. I am a big fan of frozen veggies and a big fan of Green Giant and now 25 of their frozen veggies have been endorsed by weight watchers which is pretty cool me thinks. It's yummy stuff and green is my favorite color ;) Grab a coupon off their website and get yourself some. Nom. Cook Green Giant Broccoli and Cheese according to package instructions and set aside. Saute onion till golden. Add garlic, butter and flour and cook 1 minute. Add milk and broth slowly, stirring as you add. Add contents of broccoli & cheese packet. Add remaining ingredients and cook till heated through. I chose to use my super cool immersion blender to whiz everything smooth. If you don't have a gadget like that, you can whiz it in the blender (careful not to fill blenders too full with hot liquids, do it in batches.) I served bowls topped with a sprinkle of shredded cheese. Yum! A serving bowl and spoon. * In the comment section of this post tell me your favorite Green Giant Boxed Vegetables and leave a email addy where I can reach you if you are the winner. At midnight (pacific) Friday, February 25th. I will use a random number generator to select a winner. I will announce the winner here on the blog sometime Saturday, February 26th. I will also email the winner at the addy posted. You'll have one week (7 days) to respond to my email or another winner will be chosen. Thank you for the wonderful response to the Valentine's Giveaway. We had a ton of entries. So fun! I wish I had a tub for everyone or you could all come over for a protein tasting party. We could eat protein ice cream or protein donuts and chit chat. Congratulations!!! You are the winner of the HUGE 5 lb. Tub of SEI Max Protein (in their Valentine-y pink Strawberry flavor) and a super groovy Hot Pink 28 oz. Blender Bottle Shaker. Check your mail and follow email instructions for claiming your prize. Hope you enjoy it. SEI Max is one of my favorite protein powders and my blender bottle shaker goes with me on every post weight loss surgery travel trip. Thanks for playing everyone. I've got another giveaway in the works. Whiz in blender till smooth. Top with a squirt No Sugar Added Homemade Whipped Cream and a shaving of SF Mint Chocolate or drizzle of SF Chocolate Topping, optional. and one of my ultimate favorite protein bars: Premiere Nutrition Protein Crisp Bars. Breakfast: Started my day with a Mocha Roca CLICK Protein Latte. So yummy. I didn't get to walk the neighborhood yesterday it was rainy and damp in the morning. So I turned on DirectTV Music Choice and danced. If you have DirectTV or Music Choice on your cable network you have to do this one day, you can also listen on your computer. I love it. That's the kind of exercise I like, makes you sweat and burns calories but is fun! No treadmills to nowhere for this chick. Whiz in blender till smooth. Top with optional squirt of Land o Lakes Sugar Free Whipped Cream and a sprinkle of ground almonds. If you love coffee you will love CLICK. I was asked the other day to describe the flavor differences in the two flavors: Mocha and Vanilla Latte. Mocha is coffee and chocolate flavor and is the stronger espresso flavor of the two. It's what I use mostly in my desserts made with CLICK like ice cream, cakes, crepe filling, fudge and truffles. The one I usually make into shakes and smoothies is the Vanilla Latte flavor. A lighter coffee flavor with a vanilla taste. If you love rich dark roasts or drink your coffee black go with Mocha. If you add lots of milk or creamer to your coffee go with Vanilla Latte. You can actually get these very cool packets now that come with one box of Mocha and one box of Vanilla Latte. 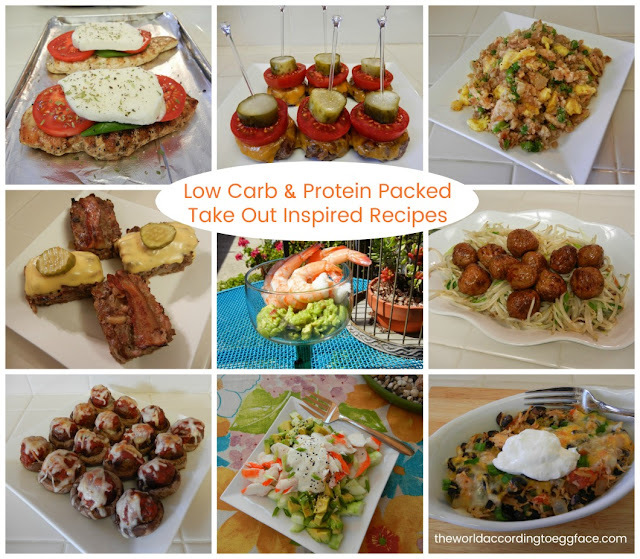 A great way to introduce yourself to CLICK or perfect for post weight loss surgery traveling. Toss a few in your carry-on or purse with your blender bottle, on the plane ask for milk or water and you are sure of something yummy and protein-packed. Lunch: Leftovers of that yummy Tuscan White Bean Stew. Even better then next day. Dinner: I grilled some shrimp kabobs and as I was cleaning out the veggie bin I found a zucchini and summer squash that needed using. Sliced them, tossed them with a Tablespoon of Basil-flavored Olive Oil, a sprinkle of Greek Seasoning, and closed them up in an aluminum foil packet that I tossed on the closed grill for 15 minutes. I considered just putting the shrimp in the packet too (also yummy) but this time I skewered and grilled them. Snacks: As usual too much coffee, a handful of green grapes midday and two CLICK Espresso Protein Truffles during Grey's Anatomy. It's an especially good season. Can I just say how much I love Dr. Alex Karev. I have a weakness for bad boys with a heart of gold. Mix all ingredients till thoroughly combined. You want a slightly stickier than Playdoh texture. Almond Butters vary slightly so if it is too sticky add a little more protein or ground nuts or powdered milk works great too. Too dry: add a little more SF Torani. Roll into walnut size balls, it's messy but worth it. Roll in optional topping choice. Place in fridge to firm before serving. Keep leftovers refrigerated. You can also freeze them and defrost in the fridge as needed. Makes about 25. Well that was my yummy day of post weight loss surgery eating. Not too shabby. P.S. Remember the Progress Souper You Contest is still going on. Here's the info on how to enter and a video of yours truly. I would love to see one of my pals get the same VIP treatment I got last year. Hope everyone had a nice Valentine's weekend. Mine was lovely. This was my beautiful Valentine's table. I made a batch of my Strawberry Cannoli and my sweet Mum got me six Sugar Free Chocolate Covered Strawberries YUM! and this gorgeous cake plate. I absolutely love it. You can change the ribbon to match the holiday. It's raining today and from what I hear it will be this weekend too. The Farmer's Market is rain or shine, we have some die-hard farmers but the weather may put a damper on my hiking plans. Looks like I may have to Zumba again. Quick! Close the blinds! I actually am enjoying the rain today. The neighborhood was getting dusty and needed a bit of a wash and I have been dying to make a big pot of Italian Grandma love. Saute onion till golden. Add sausage. I used fully cooked Italian sausage, if you are using uncooked cook till no pink is seen. Add all the remaining ingredients. Do not skip the wine, no one will catch a buzz off your stew, the alcohol will cook off but the flavor is vital. Simmer covered, on low 30 minutes, stirring occasionally. If you can make it earlier in the day or the night before and reheat even better. Everything gets a chance to love on each other. Serve with an additional sprinkle of Parmesan. 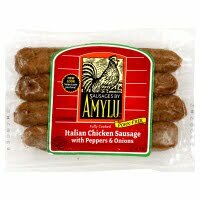 I used an absolutely delicious fully cooked Italian Chicken Sausage with Pepper & Onions made by AMYLU, ATK Foods. They also make those super yummy Sweet Caramelized Onion Chicken Burgers with Red Bell Peppers and Gouda Cheese I reviewed awhile back. Well these sausages are another winner. Highly recommend them. If you email the company I'm sure they will be able to tell you who locally carries them or looks like you can even order online. I will definitely add these to my Pantry Essentials List. Love them. P.S. If you haven't already entered my Valentine Giveaway. Click here for the 411 on that. I use SEI Max Protein in oodles of my weight loss surgery friendly dishes... Protein Ice Cream, Protein Donuts, Protein Muffins, 5 Minute Protein Cakes, Protein Shakes and Smoothies and more. It really is one of the best tasting protein powders out there. and my blender bottle shaker goes with me on every post weight loss surgery travel trip. I make up a few snack sized baggies of protein powder and store them right inside the shaker. I place the shaker in my carry-on bag, when I'm on the plane I just ask for a bottle of water or milk, empty one of the pre-portioned baggies and shake shake shake. On road trips I always know I will have a great protein source in case good choices are scarce. How to enter: Just leave a comment (include your name and an email address) on this blog posting by Sunday, February 20th, midnight (Pacific time) and sometime on Monday, February 21st. I'll draw a name using a random number generator and announce the winner here on the blog! I will also email the winner at the addy posted. You'll have one week (7 days) to respond to my email or another winner will be chosen. * Place my super snazzy badge on your site. Valentine's Day is a time to recognize things you love. I love my family, this new wonderful healthy life and my pals, both real world and cyber. Love you guys! Hope everyone has a wonderful Valentine's Day! Spotted the coolest thing at Trader Joe's. Perfectly portioned mini brie cheese wheels. Aren't they just the cutest thing ever?! Absolutely perfect for us weight loss surgery post-ops. I know some of you need to do the reduced fat/non-fat thing when it comes to cheese, my condolences ;) but for those of you who like me, eat the real deal full fat cheese. These are perfect. My thoughts on full fat... I eat full fat (cheese, mayo, butter, olive oil, etc.) Fat = flavor. I eat it in moderation (thanks to my surgically altered guts) if I ate Reduced Fat or Fat Free (aka nuclear waste) I wouldn't be satisfied and in an hour I'd be thinking about my next meal. I eat yummy, lip smacking stuff so I never feel like I'm on a diet or suffering in my new life. This new lifestyle is about making changes that you can live with FOREVER not just get through. There is no finish line, the day after you reach your goal weight, you wake up to more of the same. So to be a long term success IMHO you need to love your new life, not suffer through it. That being said, this is my journey. Always follow your medical posse's advice. $3.99 for a bag of 5 mini wheels, individually sealed .09 oz servings. Verdict: Yum! These little suckers are delicious. A few minutes at room temperature and they are oozy and gooey like the big boy brie wheels. I love them because you can take out one at a time as needed, with a big wheel once its cut it needs to be used quickly. These last for months unopened in the refrigerator (bought these the other day, expiration date is September.) They are the perfect size for us and so darn cute! I ate mine for dinner outside under the electric stars from my super cool bento box. I smeared it on cucumber slices and ate it with a turkey cold cut roll-up and a little apple compote. The perfect combination. They would be great smeared on apple or pear slices too. P.S. Hope everyone has a great Valentine's Day (aka Singles Awareness Day) I'm celebrating with a batch of Strawberry Cannoli. BIG ❤ puffy heart love to all my pals. You'll want to check out the blog this weekend ;) Something fun begins! These were soooo good. I served them for dinner with a dollop of cool Greek Yogurt Dip and some spicy Madras Lentils. A completely vegetarian meal, which I try to do at least once or twice a week. Cook till top appears dry and flip. Cook a minute or so on other side. Repeat till all batter is used. 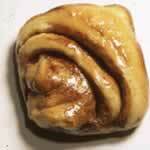 While you are making them you can keep them warm in a low oven 200 degrees or nuke for 20 seconds before serving. Makes 8-10 crepes depending on size of pan. Yes, you can use a fry pan but crepe pans with their shallow sides make the process soooo much easier. Extras can be refrigerated for a few days. Microwave 30 seconds to reheat, warm in a pan or in a toaster oven. They stand up to travel to so you can wrap them in foil or toss in a bento box for lunch. These are perfect eaten as is or you can dip them in Madras Lentils or a Greek yogurt based dip like this one or this, fill with ricotta or a sprinkle of cheese, or use them as like a wrap with things like chicken salad inside. If you are looking for a better than bread alternative this is a great option. This week sometime I plan on filling some garbanzo bean crepes with a yummy filling and baking them in the oven: manicotti-ish. I'll let you know how it goes. I used Garbanzo Bean Flour in this recipe. You could use Spelt. I make crepes with that usually but lately, I've been messing around with Garbanzo Bean (Chickpea) Flour. Unlike other bean flours, it doesn't have to be combined with other flours (though you can) and it has a yummy beany flavor. Great for thickening sauces. It's higher in protein. The stats: 1/4 cup Garbanzo Bean (Chickpea) Flour contains 110 calories, 6g protein, 18g carbs (of which 5g is fiber) and oodles of iron. It's used a lot in Sicily, I remember my Sicilian Grandmother (my Dad's Mom) used to make all sorts of things with it. Oh and it's great for those on Gluten Free diets. Looking for a sweet crepe. Here's my favorite version of those. It's that time again. There is no getting away from them. Those smiley-angelic faces are everywhere, a sweet chorus of little voices, "Would you like to buy some cookies?" In my neighborhood you can't get in a store or bank without being hit up. The itsy-bitsy Daisies (first level Girl Scouts) are the worst. That should just be illegal, they are too darn cute. How do you say "No" to those?! It's just plain mean. Ahhh but mean I must be because those little angels are hawking some of my pre-op crack. Not sure they still are packaged this way but Thin Mints boxes used to come with two sleeves of cookies inside. Wasn't that two portions? ;) Seriously though it's way too easy to eat a ton of them so since weight loss surgery they just don't get through my door. Whiz in blender till smooth. Top with a squirt Sugar Free Land o Lakes Whipped Cream and a shaving of SF Mint Chocolate or drizzle of SF Chocolate Topping, optional. Whiz in blender till smooth. Top with a squirt Sugar Free Land o Lakes Whipped Cream, a sprinkle of Toasted Coconut and a drizzle of SF Caramel Topping, optional. Whiz in blender till smooth. Top with a squirt Sugar Free Land o Lakes Whipped Cream and shaving of SF Chocolate, optional. Whiz in blender till smooth. Top with a squirt Sugar Free Land o Lakes Whipped Cream and a few chopped Peanuts, optional. If your sister, friend at work, neighbor is asking you to buy them from their kids and you feel like you must *cough* emotional blackmail. Tell your sister, friend at work, or neighbor to keep the cookies. They can figure out what to do with them. Donate your saved cookie $ to the Girl Scouts. 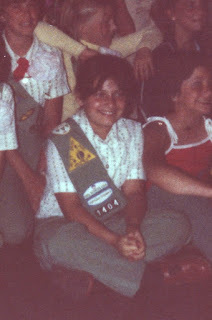 I was a Girl Scout (photo evidence below) The cookie sales money we made helped us go camping each year. Give them money instead. Or if you can be strong on the car ride... buy the boxes and drop them off at your nearest food bank.